Let 'em all in; keep 'em all out – the anguished debate over illegal immigration hasn't been rich in proposals that address the matter of incentives and disincentives to come and stay. A special task force of the institute, headed by Rep. Linda Harper-Brown (R-Irving) released Oct. 18 a set of proposals that tilt toward control of the circumstances that seem to invite illegal residence in Texas.The task force singles out, among other factors, "lax enforcement of the citizenship requirements to enroll in public benefit programs, abundant employment opportunities for illegal immigrants, a public school system that will teach students entirely in Spanish, and the presence of active political movements that advocate for and on behalf of illegal immigrants." It calls these factors "the basis upon which effective immigration reform should be based." The task force recommends voters be required to submit at the polls a driver’s license or Texas ID card, along with a voter registration card. Rep. Mary Denny (R-Aubrey) unsuccessfully tried to pass similar legislation in 2005 that would have required voters to show their driver’s licenses. The main difference is that Denny’s proposal would also have allowed a voter without a photo ID to use two forms of non-photo ID, such as a copy of a current utility bill, bank statement, or an official government document showing the voter’s name and address. Some Democrats called Denny’s measure a sort of "poll tax" that would intimidate voters. Her proposal would have allowed individuals without driver’s licenses to obtain a state photo identification card free of charge. TCCRI recommends marking the citizenship status on Texas driver's licenses or Texas Identification Cards. The federal government passed the REAL ID Act of 2005 requiring the state Department of Public Safety, beginning in 2008, to verify citizenship status of people who apply for either a driver’s license of Texas ID card. Nonetheless, the federal law does not require states to list citizenship status on the new cards. TCCRI believes listing status would help prevent illegal immigrants from voting. Other proposals include requiring voters to submit a home telephone number and driver’s license or ID number on an early voting ballot application; and prohibiting state agencies from accepting Matricula Consular cards as evidence of immigration status or identity. Much of the discussion at an Oct. 18 TCCRI Conference on Immigration centered on ways to prevent voter fraud. The Wall Street Journal’s John Fund, author of Stealing Elections: How Voter Fraud Threatens Our Democracy, discussed the importance to democracy of fighting voter fraud. After Fund's speech, the TCCRI conference featured a panel discussion with Luis Figueroa of the Mexican American Legal Defense and Education Fund (MALDEF) and Paul Bettencourt, Harris County Tax Assessor-Collector. Bettencourt talked about ways the Harris County Tax Office used technology to clean up voter rolls. He argued that technology is the key and said he supports a voter database that could be cross-checked against Department of Public Safety and Social Security databases. When the office first audited the voter roll, it found several dead people and incarcerated felons. One member suggested adopting an idea from Mexico, where voter registration certificates have pictures on it, and clerks at the polling location have access to the pictures. One of the most controversial of the proposals to limit immigrant use of public welfare programs would require changing the U.S. Constitution. TCCRI recommends prohibiting children born to non-citizens - called "anchor babies" - in the United States from becoming U.S. citizens. Texas Congressman Ron Paul (R-Lake Jackson) proposed an amendment to the Constitution, HJR 46 that would restrict birthright citizenship. This change would exclude anchor babies from receiving many welfare benefits that require U.S. citizenship. Currently, Texas hospitals are required to medically treat all individuals who visit the emergency room without regard to ability to pay or residency status. This provision, the task force argues, "paves the way for illegal immigrants to receive free health care in American hospitals." The reports states that 80 percent of all births in two Houston hospitals last year were to illegal immigrant parents. TCCRI supports changing the definition of “emergency medical care” to exclude childbirth that does not threaten the life of the mother. To determine the cost of educating illegal immigrants, TCCRI recommends requiring students to disclose their residency status to public school districts at the time of enrollment. The task force did not recommend prohibiting illegal immigrant children from receiving a public education because a 1982 U.S. Supreme Court decision, Plyler v. Doe, mandates state provide free education to all children – regardless of citizenship status. Yet school districts do not even collect data on how many illegal immigrants receive public education. Other recommendations include denying illegal immigrants access to punitive damages in civil lawsuits; and imposing fees on remittances sent to Mexico or Latin American countries. Imposing fees on money transfers was a key item in Dan Patrick’s successful campaign for the GOP nomination in the open West Houston Senate seat. It was a bill filed by two Democrats in 2005. There is, however, some question about whether the state can constitutionally tax money transfers to foreign countries, and opposition has developed in the banking sector. Sen. Royce West (D-Dallas) requested an Attorney General’s opinion Oct. 3 on the legality of the idea. * Employer sanctions. The task force supports imposing a monetary penalty on businesses that employ illegal immigrants equal to the amount of the salary paid to the worker. Other proposed sanctions include: ending property tax exemptions for businesses found guilty of employing illegal immigrants; prohibiting companies repeatedly found guilty of using illegal workers from operating in the state for at least six months; and imposing a 10 percent penalty on a business’ tax liability. * Removing bilingual education programs in public schools. Currently school districts are required to offer bilingual education to students of limited English proficiency. TCCRI believes that the state should end the instruction of bilingual education, which costs the Texas Education Agency approximately $1 billion a year. * Increase public safety. The report calls for increased funding for Border security, enabling local law enforcement to detain illegal immigrants. When pre-filing begins (after election day), expect several conservative legislators to file bills to address the immigration issue. Rep. Dianne White Delisi (R-Temple) sent out a news release Oct. 17 detailing bills she intends to file. For more than a decade, economist Ronald Ferguson has studied achievement gaps. In 2002, he created the Tripod Project for School Improvement, a professional development initiative that uses student and teacher surveys to measure classroom conditions and student engagement by race and gender. The findings inform strategies to raise achievement and narrow achievement gaps. A senior research associate at Harvard’s Kennedy School of Government, Ferguson is director and faculty cochair of the Achievement Gap Initiative at Harvard University. He spoke with the Harvard Education Letter about the most recent findings from the Tripod Project surveys. How do you define “achievement gap”? There are a lot of different achievement gaps. The achievement gap that I focus the most on is the gap between students of different racial groups whose parents have roughly the same amount of education. It concerns me that black kids whose parents have college degrees on average have much lower test scores than white kids whose parents have college degrees, for example. You can take just about any level of parental education and we have these big gaps. How much progress has been made in closing black-white achievement gaps? Huge progress since 1970, not much progress since 1990. Sixty-two percent of the overall black-white reading-score gap for 17-year-olds disappeared between 1971 and 1988. About one-third of the math-score gap disappeared during the same period. Over the last several years the gap has narrowed significantly for both 9- and 13-year-olds, but there’s been a bit of backsliding for the older teens. There’s been enough progress to establish firmly that these gaps are not written in stone. Even IQ gaps are narrowing. Measurements of the intelligence of kids less than one year old show virtually no racial or social-class differences, yet racial and social class achievement gaps are firmly established by the time students start kindergarten. Something happens before kindergarten that produces differences in proficiency. Achievement gaps are not facts of nature. They are mostly because of differences in life experience. We’ve got to figure out how to get all kids the kinds of experiences that really maximize access to middle-class skills. That’s the challenge. Some say that social inequities must be solved before we can close achievement gaps; others say it’s the schools’ responsibility to close them. Where do you stand? First of all, it’s not an either/or question. If you are talking about having black achievement levels and white achievement levels that are completely the same, then yeah, you have to deal with quite a few challenges in the domain of wealth and social capital, but that’s in the long run. In the near term, I think we can make substantial progress by affecting home intellectual climate and lifestyle as they affect achievement. The big idea that frames my thinking these days is lifestyle. Even in school, the notion is to try to provoke lifestyle changes that cause people to be a bit more focused on cultivating a love of learning among kids. Isn’t talking about lifestyle factors a way of blaming the victim? Your motivation can be to explain why we have achievement gaps or it can be to seek levers to pull in order to reduce achievement gaps. I’m seeking levers to pull in order to reduce the gaps. I don’t care whose fault it is really. If it’s the case that reading scores could rise if parents pushed their kids to do more leisure reading at home or took the television out of the bedroom, why not do it? Or why not at least tell parents that that’s an option that they have? I think most parents would want to know. Still, virtually every school can make progress even if the family achieves zero change. They’ll do better if parents do more, but no school, no institution, none of us is as good as we can be. Pretty much every school has a way to improve. I’ve been working in schools for almost a decade, paying a lot of attention to teacher-student relationships and some of the ways that teachers understand or misunderstand kids. There’s a spiral of mutual causation that can lead classrooms to be either terrible places or really nice places. A lot of it you can characterize as lifestyle. How does your research help schools change their lifestyles to support achievement? The project that I run is called the Tripod Project because we address three pieces: content, pedagogy, and relationships. And what vexes me most in the schools that I work with is that it’s so hard to get people to spend time studying the work of the students who don’t do very well. Because if our main concern is material on which students don’t do well, then why don’t we look at where the breakdown is and work on that? Just take the assignments of the students who have done poorly, sit down together, and figure out what it is that they didn’t know; why we think they didn’t know it, and talk about how to alter instructional approaches to help them. We use a protocol called Teaching the Hard Stuff to talk about whether success was feasible for the student, whether the kids were focused or not, and why they may not have been focused. People like the protocol, they enjoy using it and they almost always get up from the table with new insights, but they don’t set aside more time to do it more frequently. What does Teaching the Hard Stuff involve and what do teachers learn? It’s an hour-long protocol for looking at student work. Teachers discover all kinds of things. At least half the time the problem is with the way the assignment was written: The assignment wasn’t really testing what the teacher was trying to test; or there was a vocabulary word that had two meanings; or the context for the problem was a context the students weren’t familiar with and so the student couldn’t solve the problem. If the achievement gap is based on the nature of the experiences that students have, and if schools don’t scaffold appropriately on the understandings that kids bring from their different experiences, then kids can’t construct the new understandings. One of my favorite examples is a Pythagorean theorem problem: How far does a catcher need to throw the ball in order to throw out a runner who is trying to steal second base if the bases are 90 feet apart? If kids don’t know there’s a right angle at first base, they can’t solve that question. Where schools may contribute to the achievement gap is by not scaffolding appropriately for different kids, not differentiating instruction in ways that are grounded in what kids actually bring to the classroom. Teachers try to make work interesting and relevant by using real-world examples. But which real-world example will your kids understand? And if they don’t understand it, will they admit it? In our surveys we find that black kids in particular are concerned all the way through school with whether people think they are smart or not. If you are concerned with whether you think people think you’re smart, you are not going to speak up and show your ignorance as often. So if what the teacher just said doesn’t make sense to you—particularly if you are in a racially integrated classroom and you think the other kids are ahead of you—you are more likely to misbehave and pretend like you weren’t trying anyway, because it’s better to look lazy than stupid. What other misperceptions does your research point to? There are sometimes misperceptions about how much parents care. In our surveys, the higher the percentage of black kids in the classroom, the lower the teacher’s estimate of how many kids will say that their parents asked them what they learned in school that day. When we ask kids the same question, we don’t pick up racial differences. Now you do pick up racial differences when you get at parenting practices more directly: TVs in the bedroom, which our studies show are associated with sleepiness in class; whether kids say they watch TV at home more than anything else; how much leisure reading they do; how many books are provided in the house. Eighty percent of black kids in our surveys at the elementary level have TVs in their bedroom. Much smaller percentages of white kids do. Another misperception that folks often have is that kids who misbehave don’t want to learn. Teachers see that black kids misbehave on average more than white kids do. There’s not much dispute about that—the kids self-report worse behavior. Also, black kids have lower homework completion rates than white kids do, which they also self-report. So what do you infer? You say, well, they don’t care as much and they aren’t trying too hard. This seems to challenge the “acting white” hypothesis —that black kids are afraid to achieve because high achievement is seen as acting white. Based on the survey results that I get back from students, I believe it’s a misperception that kids think getting high grades is acting white. It’s really a matter of personal style. Students who get high grades will often have personal styles that seem to violate the endorsed expressions of racial authenticity: they may speak proper English too much in informal settings; they may listen to rock music instead of rap; they may be a little too happy-go-lucky in their attitudes. In order to fit in with your friends, you don’t have to be a low achiever or resist high grades, but you do need to be able to speak in informal settings the way kids speak in informal settings, you do have to be the kind of kid who doesn’t tolerate disrespect without a response even if it comes from an adult in an authority position. Among black kids, self-esteem rises as grades rise all the way through an A, except if it’s the kid who doesn’t fit in socially, in which case—if it’s a male—self-esteem drops as they move from a B to an A average. This is not true for white kids. How do these findings relate to your research on teasing? Some of the peer dynamics around achievement, such as teasing each other for making mistakes, may not be visible to teachers, but they are problems as early as first grade. In first grade classes where fewer than 25 percent of the students are white or Asian, I find that more than half agree that classmates tease other kids for making mistakes. Teasing for making mistakes in majority white and Asian classes is about 20 percentage points lower. Kids who worry that other classmates tease kids for making mistakes report that they worry more that they may not measure up to their classmates. Worry is anxiety, and anxiety interferes with concentration. What can teachers do to foster student engagement and create a positive peer culture? Over 80 percent of kids in any classroom say they plan to do their best all year long, if you ask them in the fall. The only ones that are still near that level in the spring—if the vast majority are nonwhite and non-Asian—are kids in high help/high perfectionism classrooms. We need to give teachers the learning experiences that help them reach and teach some of the kids who they are struggling to understand if we want kids to persist and do their best work all year. A company headed by President Bush's brother and partly owned by his parents is benefiting from Republican connections and federal dollars targeted for economically disadvantaged students under the No Child Left Behind Act. With investments from his parents, George H.W. and Barbara Bush, and other backers, Neil Bush's company, Ignite! Learning, has placed its products in 40 U.S. school districts and now plans to market internationally. At least 13 U.S. school districts have used federal funds available through the president's signature education reform, the No Child Left Behind Act of 2001, to buy Ignite's portable learning centers at $3,800 apiece. The law provides federal funds to help school districts better serve disadvantaged students and improve their performance, especially in reading and math. But Ignite does not offer reading instruction, and its math program will not be available until next year. The federal Department of Education does not monitor individual school district expenditures under the No Child program, but sets guidelines that the states are expected to enforce, spokesman Chad Colby said. Ignite executive Tom Deliganis said that "some districts seem to feel OK" about using No Child money for the Ignite purchases, "and others do not." Neil Bush said in an e-mail to The Times that Ignite's program had demonstrated success in improving the test scores of economically disadvantaged children. He also said political influence had not played a role in Ignite's rapid growth. "As our business matures in the USA we have plans to expand overseas and to work with many distinguished individuals in Asia, Europe, the Middle East and Africa," he wrote. "Not one of these associates by the way has ever asked for any access to either of my political brothers, not one White House tour, not one autographed photo, and not one Lincoln bedroom overnight stay." Interviews and a review of school district documents obtained under the Freedom of Information Act found that educators and legal experts were sharply divided over whether Ignite's products were worth their cost or qualified under the No Child law. The federal law requires schools to show they are meeting educational standards, or risk losing critical funding. If students fail to meet annual performance goals in reading and math tests, schools must supplement their educational offerings with tutoring and other special programs. Leigh Manasevit, a Washington attorney who specializes in federal education funding, said that districts using the No Child funds to buy products like Ignite's would have to meet "very strict" student eligibility requirements and ensure that the Ignite services were supplemental to existing programs. Known as COW, for Curriculum on Wheels (the portable learning centers resemble cows on wheels), Ignite's product line is geared toward middle school social studies, history and science. The company says it has developed a social studies program that meets curriculum requirements in seven states. Its science program meets requirements in six states. Most of Ignite's business has been obtained through sole-source contracts without competitive bidding. Neil Bush has been directly involved in marketing the product. In addition to federal or state funds, foundations and corporations have helped buy Ignite products. The Washington Times Foundation, backed by the Rev. Sun Myung Moon, head of the South Korea-based Unification Church, has peppered classrooms throughout Virginia with Ignite's COWs under a $1-million grant. Oil companies and Middle East interests with long political ties to the Bush family have made similar bequests. Aramco Services Co., an arm of the Saudi-owned oil company, has donated COWs to schools, as have Apache Corp., BP and Shell Oil Co.
Neil Bush said he is a businessman who does not attempt to exert political influence, and he called The Times' inquiries about his venture — made just before the election — "entirely political." Bush's parents joined Neil as Ignite investors in 1999, according to U.S. Securities and Exchange Commission documents. By 2003, the records show, Neil Bush had raised about $23 million from more than a dozen outside investors, including Mohammed Al Saddah, the head of a Kuwaiti company, and Winston Wong, the head of a Chinese computer firm. Most recently he signed up Russian fugitive business tycoon Boris A. Berezovsky and Berezovsky's partner Badri Patarkatsishvili. Barbara Bush has enthusiastically supported Ignite. In January 2004, she and Neil Bush were guests of honor at a $1,000-atable fundraiser in Oklahoma City organized by a foundation supporting the Western Heights School District. Proceeds were earmarked for the purchase of Ignite products. Organizer Mary Blankenship Pointer said she planned the event because district students were "utilizing Ignite courseware and experiencing great results. Our students were thriving." However, Western Heights school Supt. Joe Kitchens said the district eventually dropped its use of Ignite because it disagreed with changes Ignite had made in its products. "Our interest waned in it," he said. The former first lady spurred controversy recently when she contributed to a Hurricane Katrina relief foundation for storm victims who had relocated to Texas. Her donation carried one stipulation: It had to be used by local schools for purchases of COWs. Texas accounts for 75% of Ignite's business, which is expanding rapidly in other states, Deliganis said. The company also has COWs deployed in North Carolina, Virginia, Nevada, California, the District of Columbia, Georgia and Florida, he said. COWs recently showed up at Hill Classical Middle School in California's Long Beach Unified School District. A San Jose middle school also bought Ignite's products but has since closed. Neil Bush said Ignite has more than 1,700 COWs in classrooms. But Ignite's educational strategy has changed dramatically, and some are critical of its new approach. Shortly after Ignite was formed in Austin, Texas, in 1999, it bought the software developed by another small Austin firm, Adaptive Learning Technology. Adaptive Learning founder Mary Schenck-Ross said the software's interactive lessons allowed teachers "to get away from the mass-treatment approach" to education. When a student typed in a response to a question, the software was designed to react and provide a customized learning path. "The original concept was to avoid 'one size fits all.' That was the point," said Catherine Malloy, who worked on the software development. Two years ago, however, Ignite dropped the individualized learning approach. Working with artists and illustrators, it created a large purple COW that could be wheeled from classroom to classroom and plugged in, offering lessons that could be played to a roomful of students. The COWs enticed students with catchy jingles and videos featuring cartoon characters like Mr. Bighead and Norman Einstein. On Ignite's website, a collection of teachers endorsed the COW, saying that it eliminated the need for lesson planning. The COW does it for them. The developers of Adaptive Learning's software complain that Ignite replaced individualized instruction with a gimmick. "It breaks my heart what they have done. The concept was totally perverted," Schenck-Ross said. Nevertheless, Ignite found many receptive school districts. In Texas, 30 districts use COWs. In Houston, where Neil Bush and his parents live, the district has used various funding sources to acquire $400,000 in Ignite products. An additional $240,000 in purchases has been authorized in the last six months. Correspondence obtained by The Times shows that Neil Bush met with top Houston officials, sent e-mails and left voice mail messages urging bigger and faster allocations. An e-mail from a school procurement official to colleagues said Bush had made it clear that he had a "good working relationship" with a school board member. Another Ignite official asked a Texas state education official to endorse the company. In an e-mail, Neil Bush's partner Ken Leonard asked Michelle Ungurait, state director of social studies programs, to tell Houston officials her "positive impressions of our content, system and approach." Ungurait, identified in another Leonard e-mail as "our good friend" at the state office, told her superiors in response to The Times' inquiry that she never acted on Leonard's request. Leonard said he did not ask Ungurait to do anything that would be improper. Houston school officials gave Ignite's products "high" ratings in eight categories and recommended approval. Some in Houston's schools question the expenditures, however. Jon Dansby was teaching at Houston's Fleming Middle School when Ignite products arrived. "You can't even get basics like paper and scissors, and we went out and bought them. I just see red," he said. In Las Vegas, the schools have approved more than $300,000 in Ignite purchases. Records show the board recommended spending $150,000 in No Child funding on Ignite products. Sources familiar with the Las Vegas purchases said pressure to buy Ignite products came from Sig Rogich, an influential local figure and prominent Republican whose fundraising of more than $200,000 for President Bush's 2004 reelection campaign qualified him as a "Bush Ranger." Rogich, who chairs a foundation that supports local schools, said he applied no pressure but became interested in COWs after Neil Bush contacted him. Rogich donated $6,000 to purchase two COWs for a middle school named after him. Christy Falba, the former Clark County school official who oversaw the contracts, said she and her husband attended a dinner with Neil Bush to discuss the products. She said Rogich encouraged the district "to look at the Ignite program" but applied no pressure. Few independent studies have been done to assess the effectiveness of Ignite's teaching strategies. Neil Bush said the company had gotten "great feedback" from educators and planned to conduct a "major scientifically valid study" to assess the COW's impact. The results should be in by next summer, he said. The woman, however, is not India's teacher, but Lori Anderson, a former teacher and now Ignite's marketing director. Ignite says Anderson was simply role-playing. LAUDERHILL, Fla. -- School exams may be detested by students everywhere, but in this state at the forefront of the testing and accountability movement in the United States, the backlash against them has become far broader, and politically potent. The role of the Florida Comprehensive Assessment Test, or FCAT, has become central to the race to succeed Gov. Jeb Bush (R), with polls showing a growing discontent over the exams, which he has championed and which are used to determine many aspects of the school system, including teacher pay, budgets and who flunks third grade. Republican Charlie Crist is offering to push forward with the testing regime, but Democrat Jim Davis has condemned what he calls its "punitive" nature, arguing that exam pressures have transformed schools into "dreary test-taking factories." "Couple years ago one of my sons brought this quiz home, and the first question was 'What does the FCAT stand for?' " Davis told a meeting of clergy here Saturday. "I won't repeat to you what I said because I used words I'm teaching my boys not to use. . . . We're going to stop using the FCAT to punish children, teachers and schools." This election season may be the first in which the growing use of high-stakes school testing, embodied in the No Child Left Behind legislation, has reached this level of political prominence. A similar exam revolt has become a key issue in the race for governor in Texas, another state in the vanguard of the testing movement, and the issue has roiled the Ohio gubernatorial contest as well. High-stakes testing -- using standardized test scores to impose consequences affecting teachers and students -- has been embraced widely in recent years as a way to hold educators and students accountable for their performance. Experts say the movement is one of the most significant shifts in U.S. education in decades. Texas and Florida were among the states that adopted high-stakes testing early, and each has pushed its program beyond what is required in No Child Left Behind. Advocates say that under the pressure of the exams, students in Florida, Texas and elsewhere have shown significant improvements. The testing systems include the public release of schools' results and test-based financial incentives for educators, and determine which third-graders can be promoted and which high school students can graduate. But teachers unions and some parents groups have argued that an overemphasis on the tests has reduced education to rote drills and needlessly heightened stresses on elementary students, and that the reported test gains have been illusory, overstated or short-lived. Many opponents say they do not object to the testing but to the high stakes attached to the results, which they say force schools to develop a myopic curriculum focused on the test. In Florida, as many as 14 percent of 200,000 public school third-graders in some years have been held back, most for failing to make an adequate score on the reading test. In Texas, an inspector general is investigating possible cheating and other testing irregularities at almost 700 schools. While many past education debates have dissolved into intangible issues of school finance, the testing critics believe that the issue may sway larger numbers of voters because the tests are having such pronounced and immediate effects on children. "We have third-grade children who have been retained so many times they are wearing brassieres in the third grade," said Florida state Sen. Frederica Wilson, one of the leaders of the anti-testing movement here. A national poll by a pro-testing group, the Teaching Commission, showed that 52 percent of respondents thought that standardized tests do not accurately measure student achievement; 35 percent thought they do. "Our kids should be leading the world, and they're not going to get there by filling in little ovals all day long," Chris Bell, the Democratic challenger for Texas governor, says in a television ad. Gov. Rick Perry, however, is sticking to the program. "I won't dismiss the idea that there are a lot of folks out there -- maybe a large number -- who don't like testing," said Robert Black, a spokesman for Perry. "But the governor has never been one to follow polls. If you want to hold schools accountable and make sure they are learning, you have to test." Opposition to the tests has been building over several years. At first, Wilson said, opposition was considered a "minority issue" because many of the students being held back in third grade or denied diplomas were African American or Hispanic. But with children in many schools taking on more homework and rote drills, she said, enough parents have complained that the candidates "could see that the FCAT was devastating Florida families." Crist, who as Florida education commissioner supported the pro-testing agenda of the Bush administration, began the race offering to move ahead with the program. But more recently, noting that the test has become "a pejorative," he has indicated that his position on testing is more flexible. The polls aside, Crist sees support for the FCAT. "Residents across the state have said that the FCAT is making a difference," according to Erin Isaac, deputy press secretary for the Crist campaign, in response to e-mailed questions. "Charlie Crist believes that if we don't measure every student's progress every year, we don't care." His opponent expressed a different view. "Parents in this state are outraged," Davis said Saturday. "They're seeing the rote drills and the pressure. But they're not seeing their children learn." NEW ORLEANS — If the world is a laboratory, New Orleans is a petri dish. The city, notorious for having one of the worst public school systems in the country, has emerged from the aftermath of Hurricane Katrina as an experiment in education: Privately run charter schools, relatively limited before last year's storm, now outnumber government-run public schools. And the numbers could rise as the demand for quality schools grows in this still-recovering city, state education officials predict. "Suddenly, there's an opportunity to improve the community and education as a whole," said Robin Jarvis, who oversees the state-run school district that took over most of the city's public schools after Katrina. "I think largely, before, they'd given up." Since Katrina, fewer than half the city's public schools have reopened. Of the 53 that have opened, 17 are run by the state, five by the cash-strapped local school board and 31 by charter groups. Total enrollment, now at about 25,000 students, also is less than half of what it was before Katrina, officials say. People on both sides of the charter debate are watching what happens closely for evidence to bolster their theories that giving parents choices in public education pays off in student achievement — or that relying increasingly on independent, nonprofit groups to teach children is a dicey proposition. A recent federal study — downplayed by a U.S. Education Department official as a snapshot in time — found that fourth graders in traditional schools did better in math and reading than students in charters. Supporters promote charters as a step toward strengthening the city's educational system, while critics see them as eroding what's left of traditional public schools. The National Alliance for Public Charter Schools has called New Orleans the closest the country has come to an all-charter district. "You had a natural disaster in New Orleans," said charter critic Nat LaCour, secretary-treasurer of American Federation of Teachers. "Now what's happened in New Orleans is a man-made disaster." Charter schools receive public funding and generally accept a wide range of students. The schools have caught on in parts of the country where traditional public schools have faltered, such as Washington, D.C. Their charters can be pulled if progress isn't shown in test scores. Parents like Debbie Williams say they're pleased so far. "They're extremely organized," she said after dropping off her daughter, a first-grader, at Alice Harte Elementary recently. "It's early, but I have faith they're going to do well." Interesting piece. I'm going over some of these things in class this semester so I'm encouraged to ponder a little. Scholar John Ogbu captured well in some of his writings how the psychology of immigrants is different from that of the U.S.-born minorities whose families start out as immigrants like the picture painted here. According tof Ogbu (also see Suarez-Orozco, Gibson, and Stanton-Salazar), their dual frame of reference helps them to rationalize their experiences with discrimination precisely because they are immigrant. Moreover, in their experience, being a doctor, lawyer, engineer, or other high status individual is not automatically correlated with Whiteness (though it is with middle classed-ness) as it is in this country for many U.S.-born minorities. Stated differently, U.S.-born minorities (2nd & 3rd generation - and sometimes 1st generation youth who have grown up in the U.S.) do not typically compare their present situation to people in Mexico or Latin America. Instead, Ogbu and others maintain, their reference group is Anglos in which case experiences with marginality, exclusion, and discrimination are more difficult to rationalize. After all, they’re American. So the psychology is different as it will be for the majority of these immigrants’ children. I, too, write about how Mexicanidad (Mexican-ness) in the U.S. moves away from a national identity (related to their country of origin) toward and ethnic minority identity with time in the U.S. Also, U.S. Schools reflect and encourage the formation of racialized identities (as opposed to class-based ones). Laurie Olson's book, MADE IN AMERICA illustrates this well. I do agree with the thrust in this piece that the immigrant optimism that results from this dual frame is a resource and asset that should be utilized. When this optimism among immigrant children, however, confronts significant barriers like English-only, high-stakes, standardized testing at the high school level resulting in a bleak 20 percent high school completion rate for many of these children in many of our schools, the making of an ethnic minority ensues. Subjectively, they may have hope, but objectively, they’re in dire straits. This is a central point that I make in Subtractive Schooling as well. What is interesting then, as Rodolfo de la Garza notes in one of his surveys in the Southwest, the second generation takes on the identity of being "charter members" of the Southwestern U.S. Why? Because though they are "immigrant minorities," their close connection to the history, low status, and marinalization of their U.S. counterparts renders them "involuntary minorities" in Ogbu's scheme. WASHINGTON -- The cat is out of the bag -- the majority of Latino immigrants in the United States are poor. By one calculation, up to three-fifths are "working poor" or "lower middle class," with annual incomes of less than $30,000. The bad news seems worse when one considers that as Hispanics gain in the U.S. population, the share of Hispanics in poverty doubled from 12 percent in 1980 to 25 percent in 2004. Recent immigrants fared worse. In 2006, the U.S. government drew the poverty line at $20,000 annually for a family of four, or a little more than $1,600 a month. But for those newly arrived from Latin America, the average monthly salary was $900, according to a new report released this week by the Inter-American Development Bank (IDB). If immigrants, especially Hispanics, are card-carrying members of the U.S. underclass, society at large is having a hard time convincing them of it: Latino immigrants are too busy working, buying cars, purchasing homes, and even investing abroad. Such a lifestyle is not exactly the picture of poverty. The poor are supposed to be the down and out -- the hungry and depressed standing in bread lines. Under this stereotype, they struggle for basic goods and services and are left outside the mainstream, unable to get ahead. Yet observers of the Latino experience in the United States say that Hispanic immigrants generally don't fit this mold for two basic reasons: choices and attitude. Immigrants cut what corners they can to keep rent, health care, sundry expenses and taxes to a minimum. They also leave family behind, clearly the most painful among their money-saving strategies to reduce the number of dependents in the United States. The income they pull together from their jobs is pumped into work-related expenses and living essentials, putting 90 percent of their earnings back into the U.S. economy, according to the IDB. Most of the rest of their incomes they invest in their homelands as remittances. The IDB report found that immigrants will send home approximately $45 billion in remittances in 2006, creating "one of the broadest and most effective poverty alleviation programs in the world." It also found that the majority of migrants want to purchase a family home or open a small business in their home country. One-third said they had already made investments, mainly in real estate. These are not the actions of the economically deprived. Hispanic immigrants don't necessarily feel excluded or underserved either. In an education survey, the Pew Hispanic Center and the Kaiser Family Foundation found two years ago that Hispanic immigrants were notably positive about the quality of public school education in their area. More pointedly, the survey concluded that Hispanics are not a "disgruntled population that views itself as greatly disadvantaged or victimized." What Hispanics do with their money and how they live reflect not deprivation or exclusion but an attitude of abundance. Poverty is relative. Less than $20,000 a year may rank an immigrant statistically poor, but this income may be seen as a fortune to someone who was making less than a tenth of that back home. So, at the end of the day what do we have? A growing number of immigrant poor? Well, yes. A growing number of depressed and downtrodden? Heck no. Hispanic immigrants, just as their immigrant predecessors, are optimists. The IDB found that despite the fact that 64 percent of remittance senders have an annual household income of less than $30,000, most believe their economic situation in the United States is good (58 percent) or excellent (10 percent), and that they are confident about the future. Optimists, of course, make poor fodder for those who would cast immigrants as down and out. The poor that strive, spend and invest do not easily fit the argument so often used over the past months: that immigrants represent a drag to the U.S. economy. Sure, due to immigration, the ranks of Hispanics among the poor in this country have grown. And while their incomes initially may be lower than those of native workers, economists such as Jared Bernstein of the Economic Policy Institute have found that they "improve more quickly" than those of natives. Those who use poverty to disparage immigration will continue to argue that immigrants -- particularly those here illegally -- hurt the U.S. economy. The reality is that rather than increasing poverty rates in this country, Hispanic immigrants are helping decrease poverty rates south of the border -- and with that they are doing more than anyone else to stem the future flow of immigration. the ongoing crisis of men's violence against women. others before taking his own life. honestly with the extent and depth of this problem? against women is a men's issue. Some Men Hurt Women and How All Men Can Help"
Boys, they’ll probably notice, make up 80 to 90 percent of the district’s discipline referrals, 70 percent of learning disabled children, and at least two-thirds of the children on behavioral medication. They’ll probably find that boys earn two-thirds of the Ds and Fs in the district, but less than half the As. On statewide standardized test scores, they’ll probably notice boys behind girls in general. They may be shocked to see how far behind the boys are in literacy skills; nationally, the average is a year and a half. The moment an administrator sees the disparity of achievement between boys and girls can be liberating. Caring about children’s education can now include caring about boys and girls specifically. New training programs and resources for teachers and school districts are opening cash-strapped school boards’ eyes, not just to issues girls and boys face but also to ways of addressing gender differences in test scores, discipline referrals, and grades. In the Edina School District, outside Minneapolis, Superintendent Ken Dragseth and district staff implemented a gender initiative that has helped close achievement gaps and improve overall education for students. In 2002, Dragseth and his staff analyzed district achievement data. They found that girls were doing much better than boys on most academic indicators, showing that they needed to address this achievement gap. They discovered areas of need for girls as well. Edina officials decided to work on gaining greater knowledge on how boys and girls learn differently. Over the last three years, the district has seen qualitative and quantitative improvement in student performance. Dragseth says that the gender-specific techniques and gender-friendly instructional theory he and his staff learned at the Gurian Institute helped the district significantly improve student achievement. For example, he says, they have seen higher seventh- and 10th-grade state reading and math mean scores for both boys and girls. “We have also found that teacher- and parent-heightened awareness of gender differences in learning styles and appropriate strategies has been well received by students themselves,” he says. Gender training and resources used by Edina and other districts rely on information gained from PET, MRI, and other brain scans. This brain-based approach to gender was conceived in the early 1990s when it became clear that teachers were leaving college, graduate school, and teacher certification programs without training in how boys and girls learn differently. Educational culture was struggling to serve the needs of children -- the needs of girls were most publicly discussed in the early 1990s -- without complete knowledge of the children themselves. When I wrote The Wonder of Boys in 1996, I hoped to bring a brain-based approach to gender issues into a wider public dialogue. In 1998, I joined the Missouri Center for Safe Schools and the University of Missouri-Kansas City in developing a two-year program to academically test the links among brain science, gender, and teacher education. In six school districts in Missouri, teachers and staff integrated information from various fields and technologies and developed a number of strategies for teaching boys and girls. Gender disparities in achievement began to disappear in these districts. After one year, the pilot elementary school in the St. Joseph School District finished among the top five in the district after testing at the bottom previously. Discipline referrals diminished as well. In Kansas City’s Hickman Mills School District, discipline referrals were cut by 35 percent within six months. In the five years following the Missouri pilot program, more than 20,000 teachers in 800 schools and districts have received training in how boys and girls learn differently. More and more teachers are using this knowledge in the classroom. Increasingly, universities and teacher certification programs are training young teachers in the learning differences between boys and girls. On your way home this afternoon, stop by your local elementary school and see some of these differences for yourself. Walk down the hallway and find a classroom in which the teacher displays students’ written work. Stand for a moment and look at the stories. •Add more emotive and feeling details (“Judy said she liked him” “Timmy frowned”). •More blood flow in sensorial centers (for instance in the occipital lobe), with more linkage between those centers and the verbal centers in the girls’ brains. My example of the differences in boys and girls writing has a visual link. The female visual system (optical and neural) relies more greatly than the male on P cells. These are cells that connect color variety and other sensory activity to upper brain functioning. Boys rely more on M cells, which make spatial activity and graphic clues more quickly accessible. This difference is linked significantly to a gender-different writing process for boys and girls. Boys tend to rely more on pictures and moving objects for word connections than girls. Girls tend to use more words that describe color and other fine, sensory information. Not surprisingly, gender gaps in writing are often “detail” gaps. Girls use more sensorial detail than boys, receiving better grades in the process. However, when elementary school teachers let boys draw picture panels (with colored pens) during the brainstorming part of story or essay writing, the boys often graphically lay out what their story will be about. After that, they actually write their “word brainstorming” because they can refer to a graphic/spatial tool that stimulates their brains to greater success in writing. Watch a fourth-grade classroom led by a teacher untrained in male/female brain differences. You’ll probably see the teacher tell students to “take an hour to write your brainstorming for your paper.” Five to 10 of the boys in a classroom of 30 kids will stare at the blank page. But when teachers are trained in male/female brain differences, they tell students to draw first and write later. Students who need that strategy will end up writing much more detailed, organized, and just better papers. Another area where you’ll see gender differences is classroom behavior. Boys tend to fidget when they are bored. In a boy’s brain, less of the “calming chemical,” serotonin, moves through the pre-frontal cortex (the executive decision-maker in the brain). Boys thus are more likely to fidget, distract themselves and others, and become the objects of the teacher’s reprimands. Sometimes he begins to tap his pencil loudly or pull the hair of the kid in front of him. He’s not trying to cause trouble; in fact, he may be trying to wake up and avoid the rest state. Girls’ brains do not go to this severe rest state; their cerebral cortices are always “on.” They more rarely need to tap, fidget, or talk out of turn in order to stay focused. Teachers can learn how to organize classrooms so that any boys (and girls) who need it can physically move while they are learning and keep their brains engaged. The rest state and boredom issues begin to dissolve. Discipline referrals decrease exponentially. Both boys and girls can do math and science, of course, but their brains perform these tasks differently. Girls fall behind boys in complex math skills when their lesson plans rely solely or mainly on abstract formulations specified in symbols on the blackboard. However, when words, essay components, and active group work are added to the toolbox of teacher strategies, girls reach a parity of performance. Brain-based innovations to help girls in math and science over the last decade have brought more verbal elements into math and science teaching and testing: more words, more word-to-formula connections, and more essay answers in math tests. The results in both math and science achievement have been stunning, with girls closing the math/science gap in many school districts. Because of neural and chemical differences in levels and processing of oxytocin, dopamine, testosterone, and estrogen, boys typically need to do some learning through competition. Girls, of course, are competitive too, but in a given day, they will spend less time in competitive learning and less time relating successfully to one another through “aggression-love” -- the playful hitting and dissing by which boys show love. The current emphasis on cooperative learning is a good thing, and the basis of a diversity-oriented educational culture. However, because they are not schooled in the nature of gender in the brain, teachers generally have deleted competitive learning, and thus de-emphasized a natural learning tool for many boys. We’ve also robbed girls of practice in the reality of human competitiveness. When teachers receive training on how competitive learning can be integrated into classrooms (without chaos ensuing) they actually come to enjoy seeing both boys and girls challenge one another to learn better. Many girls who avoided leadership before now step forward to lead. Our children are children, of course -- but they are also girls and boys. This is something we all know as parents. When a school board makes the decision to focus on how the girls and boys are doing, all children gain. Students learn more, teachers are more productive, test scores and behavior improve, and parents and the community are happier. It does indeed feel right to help boys and girls learn to their potential. Ten years ago, our girls were behind our boys in math and science; now, we see that our boys are far behind our girls in literacy. Neither of these gaps need exist anymore, as we engage in best practices on behalf of both boys and girls. Michael Gurian, co-founder of the Gurian Institute, is author of 21 books, including The Minds of Boys (with Kathy Stevens), The Wonder of Girls, and Boys and Girls Learn Differently (with Patricia Henley and Terry Trueman). It’s all well and good to have a theory, but does it work in the classroom? This is the question the Gurian Institute has been answering for a decade. Our data shows that training district staff and teachers in how boys and girls learn differently has a profound and positive effect on grades, standardized test scores, discipline referrals, and school culture. Districts have used gender information and strategies to affect not only their coed classrooms, but also to experiment with single-gender classrooms. These experiments usually take place in core classes (language arts, math, and science). Woodward Avenue Elementary School in DeLand, Fla., outside Orlando, is an example of this dual strategy. Woodward principal JoAnne Rodkey and members of the education department at Stetson University in DeLand have collected assessment data from single-gender and mixed classes at kindergarten, second, and fourth grades. Data showed very positive results in all the grades. For example, in kindergarten the percentage of students scoring at grade level or above on DIBELS (Dynamic Indicators of Basic Early Literacy Skills) went from 40 percent in the all-boys class in the first assessment to 84 percent after the new strategies were in place. The girls’ classes went from 47 percent to 75 percent. In the coed classes, scores rose from 36 percent to 70 percent. Similar data in second and fourth grade indicates gains in both mixed and single-gender classes. Some districts form partnerships with their state departments of education to get training on gender issues. In Alabama, for instance, Director of Programs Carol Crawford initiated statewide training in 2002 for administrators and school principals. Individual districts and boards then took Gurian Institute resources and methods into individual schools. Within six months, schools began reporting increased test scores and grades for both boys and girls, as well as decreased discipline referrals. Throughout the grade levels, the theory and practice surrounding the phrase “boys and girls learn differently” can alter the academic and social environment of a district, school, and classroom. 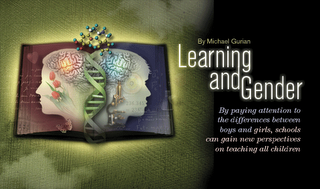 This article was co-written by Michael Gurian and Kathy Stevens, authors of The Minds of Boys. Stevens is also head of the Gurian Institute. Copyright © 2006, National School Boards Association. American School Board Journal is an editorially independent publication of the National School Boards Association. Opinions expressed by this magazine or any of its authors do not necessarily reflect positions of the National School Boards Association. Within the parameters of fair use, this article may be printed out and photocopied for individual or educational use, provided this copyright notice appears on each copy. This article may not be otherwise, linked, transmitted, or reproduced in print or electronic form without the consent of the Publisher. For more information, call (703) 838-6739. Along with painting and gluing and coloring and playing, Kisha Lee engages the youngsters in her day-care program in another activity: testing. Three- and 4-year-olds take spelling tests of such words as "I," "me" and "the," as well as math tests, from which they learn how to fill in a bubble to mark the right answer. Test preparation for children barely out of diapers is hardly something Lee learned while getting her education degree at the University of Maryland, she said. But it is what she says she must do -- for the kids' sake -- based on her past experience teaching in a Prince George's County elementary school. "Kids get tested and labeled as soon as they get into kindergarten," said Lee, who runs the state-certified Alternative Preschool Solutions in Accokeek. "They have to pass a standardized test from the second they get in. I saw kindergartners who weren't used to taking a test, and they fell apart, crying, saying they couldn't do it. "The child who can sit and answer the questions correctly is identified as talented," Lee said. "It hurts me to have to do this, but it hurts the kids if I don't." Lee's approach underscores the culture of testing that reigns in the United States. Americans like tests so much that they have structured society around them. Newborns are greeted into the world with the Apgar test to measure activity, pulse, reflex, appearance and respiration. Getting a 3 or below is like getting an F. Soon to follow are assessments -- the first of many -- that will compare them with their peers. Are they crawling, sitting, walking at the correct age? In no time, kids are facing tests to measure school readiness. Four-year-olds are tested in literacy and math in Head Start programs, and kindergartners undergo tests to see who is "gifted." By then, they are firmly ensconced on the testing treadmill. "We are obsessed with tests," said Occidental University education professor Ron Solorzano, who used to teach in Los Angeles public schools. "We are pretty much preparing [kids] for the SAT at the age of 6," added Solorzano, who also worked at the Educational Testing Service, the world's largest private educational testing and measurement organization. Americans embrace tests because they are entranced with objectivity -- or at least the appearance of it, experts say. "Merely having a number associated with something makes it sound worthwhile, even if the number isn't all that valid," said Robert J. Sternberg, dean of Tufts University's School of Arts and Sciences and former president of the American Psychological Association. No topic in education sparks as much debate and division as testing -- especially standardized testing. Although U.S. students have never been strangers to tests, President Bush's No Child Left Behind initiative has revolutionized the process. Implemented in 2003, the law seeks to hold schools accountable for results. It not only added a national mandate for testing, but also raised the stakes higher than ever. A single test today can determine grade promotion or high school graduation, a teacher's salary or a principal's job. Proponents say standardized tests are the best objective tool to hold teachers and schools accountable; opponents argue that the tests prove nothing more than that some kids are better at taking tests than others. "The problem is not the tests themselves," Sternberg said. "They are assigned a value way beyond what they actually have. It has become like a cult." The testing culture "has a lot more momentum than it should," agreed Harvard University education professor Daniel Koretz, an expert on assessment and measurement. He said a lack of solid research on the results of the new testing regimen -- or those that predated No Child Left Behind -- essentially means that the country is experimenting with its young people. Tests, experts say, also serve as self-fulfilling prophecies; the most elite schools accept only students with top scores and then brag that it is these students who do well. The current craze of ranking schools also perpetuates the importance of tests, they say. Ask students what they think about standardized tests and many agree with Leah Zipperstein, a junior at Colorado College. She said she remembers her teachers in Cincinnati spending weeks in middle and high school helping kids practice to pass the tests rather than teaching something more substantive. "I'm so sick of caring about those tests," she said. "I think we have probably, as a culture and as a society, gone too far," said Michael A. Morehead, associate dean of the College of Education at New Mexico State University. "We need to really reflect on what these tests imply. They don't really evaluate character. They don't really evaluate persistence of an individual." Standardized tests also don't measure values or attitude, said Daniel Chambliss, a sociology professor at Hamilton College in Clinton, N.Y.
"Tests measure very narrow kinds of things under very specific circumstances," he said. "And real life doesn't work that way." Some polls indicate that a majority of Americans are growing dubious of high-stakes standardized tests; three of the major gubernatorial candidates in Texas, for example, want to de-emphasize the state's high-stakes exam. Still, nobody expects tests to go away; in fact, the latest wrinkle in the debate is about a national test that would supplant the state and systemwide tests now given. That is why Pat Wyman, an instructor at California State University at East Bay and author of "Learning vs. Testing: Strategies That Bridge the Gap," says students should just learn how to deal with tests -- of all kinds. As educators in the United States struggle to expand their view of learning to embrace the whole child and not just achievement test scores, it is encouraging to know that other nations are engaged in similar processes. China, a country I have been fortunate enough to visit twice in the last two years, is also challenging itself to build a system that addresses the whole child. This summer I traveled to China to participate in the first China-U.S. Education Leadership Conference. What I learned and experienced expanded and clarified the impressions I formed during the ASCD Board of Directors trip to China in November 2005. I didn't hear the word “achievement” once on either trip. Instead, the Chinese educators I met spoke constantly of “learning,” with an emphasis on lifelong learning, a phrase that seems somewhat passé in the United States these days. I asked myself some questions in the face of that realization. When we put so much emphasis on achievement, do we cause more problems than we solve? When we allow the rhetoric of achievement and testing to control the dialogue, do we take attention away from the whole child—from the creation of thinking, democratic citizens who are learners? Is schoolwork truly more important than the work of real-world thinking and problem solving? Granted, some of the dialogue in the United States now addresses improvement of the whole child. But that kind of language actually moves the conversation away from the whole child and learning and back to measuring the whole child. There's a big difference. At the China-U.S. Conference, Yang Jin, a deputy director-general from the Chinese Ministry of Education, described the educational challenges China confronts as it tries to change the face of education. These challenges reflect many of the paradoxes that China as whole must address: economic disparities between cities and rural areas, a massive population, a sprawling geography, and the growing pains of an emergent international powerhouse. He also offered the strategies China will use to meet those challenges. I believe educators around the world can learn from the experience of the Chinese. Although China mandates that all children will go to school for nine years, 176 counties—about 10 percent of the total—have yet to implement systems to make it happen. Strategy: Spend 10 billion renminbi (about US$1.1 billion) to build 7,000 additional rural schools by the end of 2007. In addition, build more dormitory facilities for junior secondary schools. The dropout rate in China is high; children from poor families can't attend school. Strategy: Provide a comprehensive system of financial aid so that 30 million poor students, especially those in rural areas, can get free textbooks. Those students won't have to pay miscellaneous fees, and subsidies will be provided for their accommodations. Almost 23 million children are unlikely to receive a good education because their parents are among the 6.5 million adults who have moved from poor, rural areas to booming cities, leaving their children behind. Strategy: Craft policies so that the governments of cities where workers are moving assume the main responsibility for funding rural education for migrants' children. Enrollment in China's preschools is low. Current preschools cannot meet the demands for early childhood development. Strategy: Expand opportunities for preschool education, and provide parental guidance to improve early childhood family-based education. Only half of 15-year-olds can currently progress to upper secondary schools, which are very selective. Strategy: Expand total secondary enrollment. Develop vocational education opportunities so that vocational and regular secondary opportunities stay about even. Insufficient funding is available for education. In 2004, it was just 2.79 percent of China's gross domestic product, among the lowest levels in the world. Strategy: Establish a guarantee to finance compulsory education, and clarify the responsibility of all levels of government for providing such funding. Significant educational disparities exist between urban and rural areas and eastern and western China. Between 70 and 80 percent of students reside in the much poorer rural areas. Strategy: Promote balanced basic education by focusing on equity as the key and compulsory education as the priority. There is a shortage of qualified teachers in rural areas. In 2004, 500,000 temporary teachers—often less qualified than permanent teachers—were teaching in rural schools. Strategy: Implement on-the-job teacher training to enhance competencies. University graduates are being encouraged through various incentives to work in rural and western areas of China. The Internet is available in just 5.6 percent of primary schools and 20.4 percent of junior secondary schools. Classroom technology is generally in short supply. Strategy: Network 37,000 secondary schools by 2007. By then, 370,000 primary schools will have satellite transmission capabilities, and 110,000 primary schools will have DVD and CD players. Concepts and ideas of education need to be more innovative. Instructional methods need to be upgraded and curricula improved. Strategy: Implement far-reaching reforms around curriculum and teacher quality. Emphasize learning and teaching. Focus on student health because Chinese children spend a great deal of their time in school. To support those strategies, Chinese educators and policymakers focus on balanced education that leads to the development of a “harmonious society.” That implies equality of educational rights and comparable education processes with relatively equal facilities and levels of teacher quality throughout the country. In a nation as large and diverse as China, the goal of balanced education is intended to be relative rather then absolute, dynamic rather than static. Thus, it comes as no surprise that China is reducing its reliance on rigid testing, while increasing its emphasis on formative and value-added assessment. Ultimately, China wants every child to become fully developed—morally, ethically, physically, intellectually, and aesthetically. Expected changes described by Yang include changing from teacher-centered to student-centered approaches and from delivering knowledge to fostering students' creative competence. What can educators in other nations learn from China? Regardless of international differences, we should all take heed of China's concern for the development of a whole child who is capable of being part of a harmonious society. Can we make the same commitment? Can we make it possible for our children to become adults who continue to learn as they live their lives? Perhaps the most important lesson to learn from China is the need for continuous reflection on the goal of schooling. The more time I spend learning how educators worldwide approach their important work, the more I believe we all need to question anything that interferes with this straightforward goal: Schools should encourage and nurture children now so that they will develop into complete human beings who can participate meaningfully in society in the future. ASCD President Richard Hanzelka is director of the Eastern Iowa Writing Project at St. Ambrose University in Davenport, Iowa. During the 1990s, Texas became a national leader in education reform when a bipartisan group of Texans joined together to establish academic standards and accountability as the framework for transforming public schools. The reforms began in 1993 when the state adopted a new accountability system that linked school accreditation with success in meeting academic standards. At the time it was a radical concept, but over the next few years Texas adopted other sweeping initiatives that would place it at the forefront of a growing effort to improve education. Chief among the changes was Senate Bill 1, legislation that in 1995 began the largest overhaul of the Texas Education Code in half a century. It increased local control of schools, created the State Board for Educator Certification and established charter school authority. Over the next 10 years, Texans would adopt knowledge and skills standards, statewide reading and math initiatives and end social promotion. Tougher high school programs and graduate exams would be instituted and in 2006 math and science courses were added to high school curriculums. The reforms made a dramatic change in the delivery of public education in Texas. They resulted in an increase in state assessment pass rates from 45 percent in 1992 to 85 percent in 2002. The percentage of students taking college prep curriculum increased to 68 percent and the number of AP scores acceptable for college credit tripled. In addition, each ethnic group in K-8 outperformed the national average for their peers and began to close achievement gaps on state and national tests. The progress was remarkable but problems remain. Gains were largely at the elementary level, and our students' proficiency to succeed in middle school and beyond presents a huge challenge. Even with the progress, K-8 Hispanic and African-American students lag two years behind their Anglo classmates. Eighth-grade reading proficiency is below national average and eighth-grade reading (26 percent) and math (31 percent) proficiency are too low to support success in advanced studies. Although more students are taking a more rigorous curriculum, proficiency of high school graduates has not improved. Only 18 percent of high school graduates acquire skills necessary for college and the workplace, and 52 percent of high school graduates require remediation to do college work. There are major gaps in the pass rates between the high school exit exam and the college ready scale score and the Texas higher education graduation rate is the fifth lowest in the nation. The bottom line is that unless current trends are reversed, a majority of Texas students will be unprepared for success in higher education and the 21st century workplace. How we meet that challenge is important for the educational future of our children and the economic future of our country. We are already behind. Most of our international com-petitors are producing larger, more highly competitive work forces; most industrialized countries outperform American students in science and math; and most have higher standards for high school graduation. The result likely means that our children will be the first generation of Americans worse off economically than their parents. The Texas Center for Demographic and Socioeconomic Research predicts that, based on the current rate of population growth and pace of educational improvement, Texans will experience a 12 percent decrease in average household income and a 40 percent increase in poverty in less than forty years. The urgency for action couldn't be more evident. We must not allow this prediction to become a reality. We must develop a long-term plan for moving to the next phase of public education reform so that our students can begin to immediately accelerate their preparation for success. • Enhance educator effectiveness: No education delivery system can be better than the educators in the school building. We need much better and more competitive preparation, certification reform, research-based professional development, effective mentoring, performance-based compensation, value-added evaluation, mandatory remediation and dismissal of ineffective educators. • Raise standards: After 10 years, it is clear that TEKS needs a complete overhaul. The expectations for our kids are too low, there is no grade-level specificity, no progression of rigor from grade to grade and in many instances, the standards are not measurable. • Strengthen accountability: We should phase into a 90 percent proficiency standard for accreditation of a campus, strengthen the consequences for school failure, adopt statewide public school choice, and expand charter school authority with equalized funding and tougher standards. • Refine academic performance assessments: We should adopt value-added evaluation for charters, educator preparation programs and educator compensation; add end of course exams in high school; and connect all assessments to college and workplace readiness expectations. Finally, we should create a comprehensive agenda for systemic long-term reform for public education that will fulfill the objective that every child in Texas will graduate from high school fully prepared for higher education, the 21st century workplace and responsible citizenship. What Texans can dream, Texans can do. Working together, with the energized leadership of the business community, we can build the schools we need to thrive in the highly competitive knowledge-based economy and once again lead the nation in public school innovation. Windham heads the Texas Institute for Education Reform.